David Shulkin at a news conference in March. President Trump intends to replace VA Secretary David Shulkin with the White House physician, Navy Adm. Ronny L. Jackson, the president announced on Twitter Wednesday. "I am thankful for Dr. David Shulkin's service to our country and to our GREAT VETERANS!," Trump also said online. Until Jackson is confirmed by the Senate, Trump said that Robert Wilkie of the Department of Defense will serve as acting secretary of the VA. "Mr. Wilkie is currently the Undersecretary of Defense for Personnel and Readiness at the Department of Defense and overseas health affairs, welfare and quality of life for military families," the president said. As for Jackson, Trump said he was "proud" to nominate the White House's top doctor to take over the VA. "Admiral Jackson is highly trained and qualified and as a service member himself, he has seen firsthand the tremendous sacrifice our veterans make and has a deep appreciation for the debt our great country owes them," the president said. Shulkin began his tenure in the Trump administration with a few strikes against him. He was the first non-veteran to lead the department, instead bringing years of experience as a physician and a health care CEO. He was offered the job only after several others turned it down, and he was an Obama appointee — the lone hold-over in the Trump White House. That made it all the more unlikely for Shulkin to be so successful — for a time. Known on Capitol Hill as a technocrat brought in to help overhaul the VA in 2015, he coasted to confirmation — 100 to 0 — by the Senate. He hit the ground running, already adept at the labyrinthine VA health network of more than 1,000 hospitals and clinics. 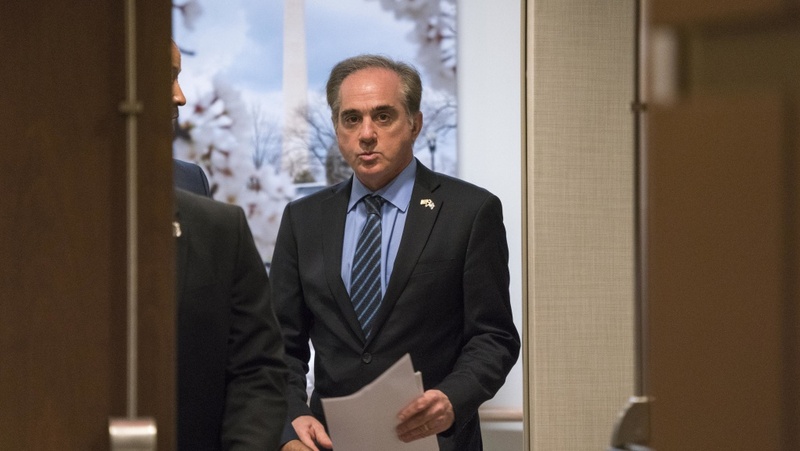 With bipartisan agreement on many fixes needed at the VA, Shulkin helped push through an expansion of mental health care, increased suicide prevention and a law making it easier to remove poor performing officials. For a time, President Trump seemed to really like Shulkin, even joking that he'd never have to use his reality TV line on him: "You're fired." "We'll never have to use those words on our David. We will never use those words on you. That's for sure," Trump said last June. Then his tenure got strange. Headlines openly pondered who was in charge at the VA, and veterans service organizations, which strongly support Shulkin and oppose privatization, started using words like "coup," and circulating lists of officials in the VA who were trying to undermine President Trump's VA secretary. That list included Shulkin's top two public affairs officials, who were accused of lobbying Congress to get rid of Shulkin. The secretary apparently lost control of his own public messaging. His own statements were removed from the VA website and his chief of staff abruptly replaced.